More prisoners have joined a hunger strike at the U.S. detention facility in Guantanamo Bay, Cuba. The number of suspected terrorists involved has risen to 24 as of Tuesday, Pentagon spokesman Lt. Col. Todd Breasseale said. There were 14 last week. 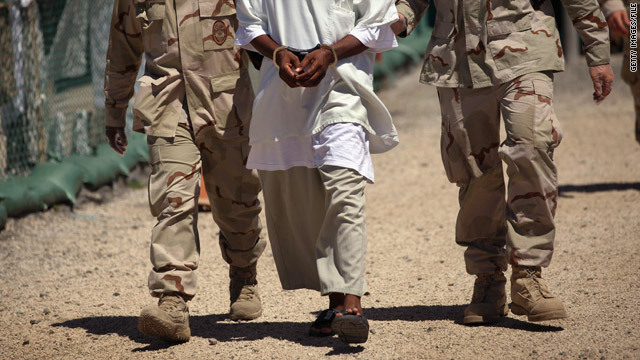 U.S. military officials deny detainee lives are in danger. Breasseale said eight require feeding tubes that are administered through the mouth. There are 166 suspected terrorists being held at the detention facility. "The medical staff continuously monitors and provides outstanding medical care to detainees in our custody," Breasseale said. "The health and well-being of detainees is their primary mission and they take this duty as seriously as they would a duty to treat our own service members or any patient in their care," he said. Beginning last year through mid-February, between five and six detainees started and stopped hunger strikes, Breasseale said. But the numbers grew after lawyers for some of the detainees drew attention to conditions at the facility, Breasseale said. "The reports of hunger-strike related deteriorating health and detainees losing massive amounts of weight are simply untrue," Breasseale said. David Remes, a Washington-based lawyer who represents 15 detainees at Guantanamo, said his February visit shocked him. "I think every one of the clients I saw had lost 30 pounds or more when I was there," Remes said. "They were weak and chilled." Remes said two of his clients were unable to meet because they were too weak from their hunger strike. He said he knows that at least six of his clients are participating. He said his clients told him the strikes were "the last straw" in response to what was described as more intrusive treatment in recent months. For instance, his clients were unhappy with an early February search of detainee personal items and an intent to search Korans, something that had stopped in 2006. "It is incredibly insulting to Islam as far as these men are concerned, most of whom are very devout Muslims, and it seems to be solely to demonstrate the administration's (Guantanamo commanders) power and not on a justification basis," Remes said. He said checking Korans pushed them toward the hunger strike but other incidents stoked their anger. In one last January, a guard in a watch tower shot at a group of detainees who had gathered to complain about another issue. "Rarely does what is relayed to defense counsel by the detainees, which some members of the defense council then dutifully take to the press, match with reality," Breasseale said in response. "This is another example of myth-making by the detainees. Only after detainees attempted to climb the fence and then hurled stones at the guards in the tower, was a single shot fired and only after reasonable cause, was a cell ever searched," according to Breasseale. Last Thursday, Remes and more than 50 other lawyers who represent detainees at Guantanamo wrote to Defense Secretary Chuck Hagel, complaining that they have been receiving reports by detainees that the, "health of the men has continued to deteriorate in alarming and potentially irreparable ways." The letter asks Hagel to meet with the lawyers to work out a solution. Do you remember your promise to close Guantanamo? Or atleast tell us what is stopping you from keeping your promise? Feeding hunger strikers with a tube, i.e., force feeding, is widely considered torture in the civilized world. I agree with Big Brother Breasseale, with one slight change: Rarely does what water carriers - like Breasseale himself or General Kelly– "dutifully take to the press" ever match reality (starting with non-existent WMD, of course). So the inmates are on a hunger strike? That works for me, either that or they die of old age, since getting any of them to trial seems to take forever. Look, I'm no fan of terrorists and don't understand why we "arrest" terrorists instead of taking them out. I find it even more odd that we "arrest" them and hold them for 11 years without any charges. 11 years? Come on...poop or get off the pot. File charges, have a trial and then take the appropriate action, but 11 years without any charges is ridiculous and unacceptable by any standard. Agreed, paulm5545. In fact, since they had to endure so much torture while in custody, I say, turn them loose! This kind of abuse is truly Un-american and needs to be outlawed once and for all! Good we'll save some food money. In fact make it mandatory for them to fast 15 days out of a month; we need to cut the operating cost into half. The right-wing goons who run Gitmo need to be indicted, taken to the Hague and prosecuted for the unwarranted torture of these political prisoners there. Don't you agree, Phunnie boy? I certainly do George, all joking aside! Seriously, those creeps who continue with this kind of torture of the political prisoners are themselves a national disgrace along with the neocons in Washington! Maybe this will finally close Gitmo! If they chose to starve to death, so be it! We tried to get other countries to take some of these people, but no country wants these people! So starve to death! Happy ending to what GW and Cheney started! Really, stan? Somehow I don't think so! Don't you think that these people suffered enough, especially after the fact that 85% of these people just happened to be at the wrong place at the wrong time?